Western Digital has started sampling its 96-layer 3D NAND chips featuring QLC architecture that stores four bits per cell. The chip happens to be the world’s highest-capacity 3D NAND device. The company expects to commence volume shipments of this memory chip already this calendar year. Western Digital’s 96-layer BICS4 3D QLC NAND chip can store up to 1.33 Tb of raw data, or around 166 GB. The IC will be initially used for consumer products Western Digital sells under the SanDisk brand, so think of memory cards (e.g., high-capacity SD and microSD products), USB drives, and some other devices. The manufacturer expects its 3D QLD NAND memory to be used in a variety of applications, including retail, mobile, embedded, client, and enterprise, but does not elaborate on timing at this point. Western Digital and its manufacturing partner Toshiba started volume production of 96-layer 3D NAND earlier this year. 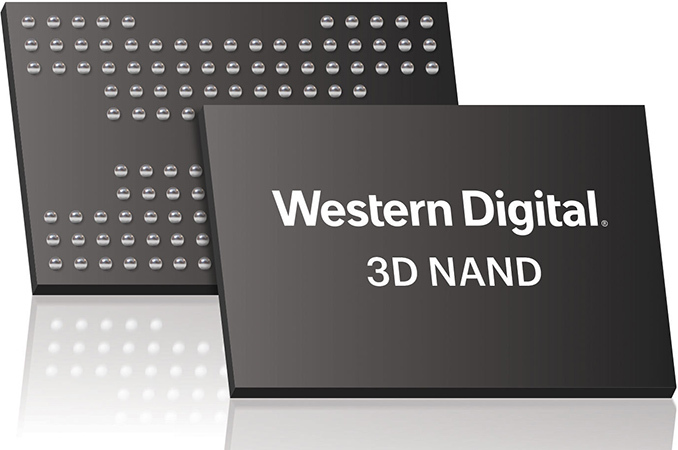 Western Digital confirmed in late May that it had begun volume shipments of its BiCS4 memory to its retail customers, which most probably means that the new 96-layer 3D NAND ICs were used for select SanDisk-branded products. 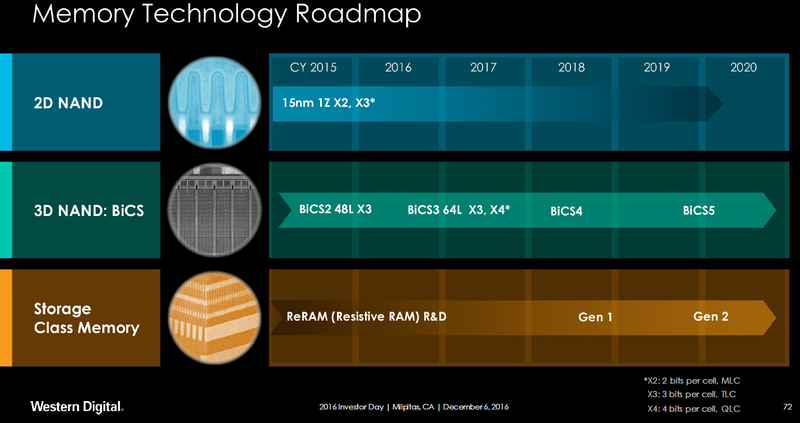 The first BiCS4 products that Western Digital announced were 256 Gb 3D TLC ICs, so it is highly likely that they have been in mass production for some time now. As it appears, yields of 96-layer 3D NAND have been good enoug,h and things that the company has learned with BiCS3 QLC were substantial, so Western Digital moved right to its top-of-the-range capacity of 1.33 Tb per chip. 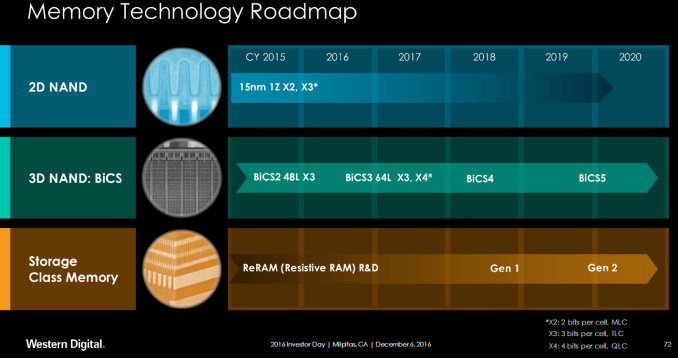 What is noteworthy is that officially the BiCS4 range was to include both TLC and QLC ICs with capacities ranging from 256 Gb to 1 Tb, so the 1.33 Tb IC is a surprising addition to the lineup which signals Western Digital’s confidence of its technology. "The IC will be initially used for consumer products Western Digital sells under the SanDisk brand, so think of memory cards (e.g., high-capacity SD and microSD products), USB drives, and some other devices." User 1: Dear me, what are those things coming out of Western Digital's nose? A blog about QLC was claiming that QLC will have about the same total data written endurance as TLS/ML/SLC. You're mostly just giving up cycle endurance. As long as you don't do a lot of in-place updates or use a COW style filesystem and don't delete anything, it'll be pretty much the same. What exactly is "total data endurance" vs. "cycle endurance"? What you can use to define the endurance is an absolute measurement like P/E cycles. This is the one defining the cell and the technology. "Total data endurance" or most likely TBW and is always relative to the size of the whole SSD. And DWPD is equally relative since it will relate to the warranty period instead of the actual physical capability of the cells. And without changing some other parameters of the technology, like moving from floating gate transistors to charge trap flash (more or less from planar to 3D), or making the cells a lot larger, using larger fabrication nodes, there is no theoretical way in which QLC is as reliable as TLC or MLC. In practice it might as well be since manufacturers tend to be very conservative and understate the endurance to avoid customer backlash and lawsuits if they overstate it. I have SSDs that exceeded their declared endurance several times over. And the SSD itself might crap out even if most of the cells are still more than capable of holding charge. My naive layman understanding is for all things being equal, TBW across SLC, MLC, TLC, and QLC are about the same, assuming ideal IO patterns. The more bits you store, the more sensitive to write amplification. When it comes to bulk storage, QLC is going to be almost exactly as reliable as SLC. Google was also talking on this general subject. In general, they've been starting to us TLC drives in their servers because the failure rate between TLC and SLC are nearly identical in their datacenters. Their SSDs almost never "wear out". They either die to defects or get replaced as part of a normal upgrade cycle. The second paragraph is something that I can sign off on. The SSDs I've seen or heard of failing, failed before their endurance was up. Conversly, there was a large-ish test of Samsung 830 SSDs that had them write tons of data continuously and it far exceeded the specified write endurance. Often times a shutdown would result in the drive becoming unusable though, suggestion other issues at play. The first paragraph seems weird, though. SLC has many more write cycles, more than the other technologies (eMLC might come close). It doesn't compute that it should be almost identical to QLC in similar conditions.